The richest God in India Lord Venkateshwara, situated in the Seven hills called Tirumala, Tirupathi. Has now come down to Bangalore at Malleshwaram, Vyalikaval. Due to growing number of devotees and time taken for the Darshan, TTD (Tirumala Tirupathi Devasthanam) has consider to open a replica to Temple right here in Bangalore at their office in Vyalikaval, Malleshwaram, Bangalore. The Pratistapana of the Lords shall be organized from May 21st to 23rd 2010 at the Temple Premises. 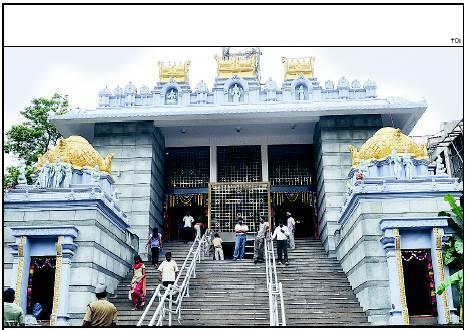 The Lord Venkateshwara Temple will be open to devotees from 13.00 hrs. on 23rd May, 2010. This temple will be exactly the replica of the Tirumala Tirupathi Temple. The new temple will have the same pujas as being conducted at the Main Shrine at Tirumala. The devotees in Bangalore and Karnataka, can now visit the Temple and conduct the same poojas, sevas and also seek blessings of the Lord, here in Bangalore. However, the idol of Lord Venkateshwara is smaller then the original one at Tirumala. The temple was constructed as per the Agama Shastra, under the guidance of TTD temple architects and statapathis. The rituals will be performed in accordance with Vaikhanasa Agama Shastra. The Temple will be open to devotees from 13.00 hrs. on 23rd May, 2010.